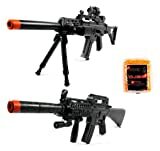 (COMBO) Combat Tactical R36 Spring Airsoft Gun FPS-230 + Black Guard M16-A12 Spring Airsoft Gun FPS-250 + 1000 Round BB's Bag (UPC 617390287111) is sold at the following online stores. We've find the latest prices so you can compare prices and save money when making your purchases online. Please click on the links below to browse to each store's webpage.